What do you do if the fitness app you want to use only exists in your head? The answer, if you're Dr Sophie Mullins, is to make it from scratch. Mullins is a historian-turned-software engineer-turned-ultra-runner. She got into running "almost by mistake" 12 years ago and has since gone on to win the British 100k title in the Anglo Celtic Plate. 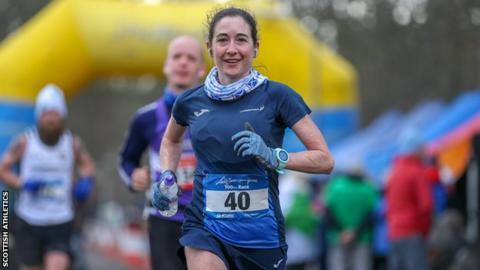 "I made an app to calculate my nutrition for the race - looking at the carbs, proteins I might need for my body weight," she told BBC Scotland. "It looked at what was in the different things I might consume, so I could make easy decisions on the fly. "You couldn't eat too much or you'd be sick, which defeats the purpose when you're getting the food in for fuel." It has worked. Mullins set a new personal best after 42 laps along the River Tay. Now, she could represent her country at next year's World Championships, having met the standard with her time in Perth. Ultra-running is a gruelling sport. Mullins began her bid for the British title at 07:00 GMT in Perth last month. Eight hours and three minutes later, she crossed the finishing line. "I stayed in the pack for the first 35k then went off the front and at that point I knew I could sustain the pace," she said. "When I sped up I actually felt better than I had in the pack. I decided to try and get a lap in hand so from 40k, I picked up the pace. "I kept on going until I was a lap ahead of all the women, then I was able to settle down and enjoy it." Mullins has competed with Scotland East in the Scottish Athletics set-up, and has run in several national championships in the past year, including the National Cross Country Championship in February and last year's National Relay Championship. But how does she keep going? "Dog bingo," she explained. "When you've been running for two hours and your brain says there's another six to go, that's not a good thing to think. "You distract yourself. We have a list of dog breeds we hope to see when we're running during the day in Perth. So, some poor person with a German Shepherd - which is the last on the mental bingo card - usually has us running past going, 'bingo!'" Mullins, who was born in Hertfordshire, moved to Scotland in 2006. She says she "never really ran in England," though, so competing for Scotland was never in doubt. She signed herself up for a marathon when she was, in her own words, "very average". The next big step was the Highland Fling, which follows the first 53 miles of the West Highland Way. "I wasn't well and I fell in a river, cut my knee and bruised myself quite badly," she said. "I fell about 30 miles in. I also fell about 30 miles into it when I did the full Highland Way. I chipped my shin bone and broke a rib - and there was still 65 miles to go." Mullins has signed up for a number of ultras in 2019 - but first, she intends to return to the Fling and get beyond the dreaded 30-mile marker. Ninety percent of the route is on trails instead of roads, with Mullins aiming to book her place in the team for next year's World Championships. "I had a really disappointing run last year," she added. "Hopefully I can stay upright."